Sight Cast Fishing — Methods, Strategies, and Flies for Sight Fishing to Sheepshead. Winter fly fishing along the Gulf Coast is often a feast or famine situation when it comes to sight fishing the shallow flats, but there is one fish to target this time of year that is slowly gaining popularity and recognition in the fly fishing community. The Sheepshead, otherwise known as the "Texas Permit", “Cajun Permit”, "Prison Permit", or "Convict Fish", is proving to be a challenging, exciting, and notoriously difficult to catch fish. It requires patience, technique, proper presentation, and it is the perfect solution to ease those winter time lulls while you’re waiting for early spring fishing to peak over the horizon. You can target these jail breakers any time of the year, but you’ll notice that during the warmer months Sheepshead will bolt away at even the thought of casting to them. Something changes in the colder months as the grass dies off and the sandy bottom is exposed. They tend to get much more aggressive and are often seen in very large numbers strutting down the flats along sand bars and shorelines. A good place to start looking for Sheepshead is a spot that contains a mixture of different bottom textures, such as broken shell next to areas of hard sand. Generally the same flats that hold Redfish in the fall will house Convicts in the winter. It is not uncommon to stand in one place and cast at an endless supply of Sheepshead as they come cruising down the flat in groups. So when you start seeing them, put on the waders and hop out of the boat or kayak. You’ll have the best success while wade fishing, because in a moving boat it is very difficult for your fly to come to a complete rest. And as you'll find out, they tend to like their dinner served on the bottom crawling slowly. When you spot a Sheepshead and are ready to sight cast to them, try and get the fly as close as possible without spooking them and then play it slow and be patient. Most of the time they will not “jump on” or “smash and run” with the fly like a Redfish does. These fish spook easily and very little retrieval is necessary. They do not like a fast moving fly being stripped in the middle of the water column. Use short and slow strips accompanied with long, lingering pauses to make your fly crawl along the bottom. You must convince them your fly is a real crustacean critter and allow them to come investigate. When you see them nose down on your fly this is when you STOP and read the fish. They will typically nibble at the fly and will spit it out quickly. This means that most of the time you will hardly feel anything and it’s this behavior that you must pay absolute attention to so that you increase your chances of feeling and seeing the fish eat before they spit it out again. 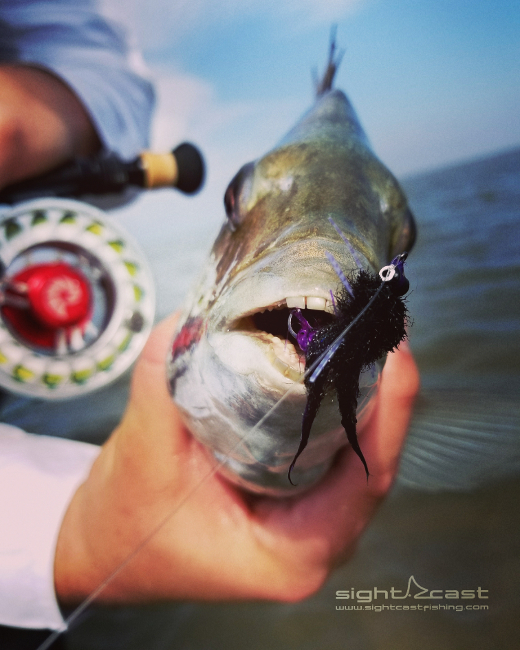 The technique to conquer this finicky fish is to keep the line tight from the fly to your hand and “strip set” upon feeling any tension, biting, or pecking. Strip setting is crucial due to their erratic style of eating and spitting out. This also allows you to keep your fly in front of the fish in the event you don't get a hook set. So if you do miss the hook set, just let the fly rest, and the fish will usually come back to it for another taste. Focus on crawling that fly along the bottom, keeping the line tight, and strip setting on the slightest tugs. More often than not, when people begin to get frustrated that the fish aren’t eating, the reality is that the fish has probably already eaten and spit your fly out multiple times without even being noticed. Reading the fish and feeling the line tension is key to a successful day. So what's the best fly to use for sight fishing to Sheepshead? We tend to favor the flies in this Sheepshead Fly Pack, but any fly you choose should share these same overall characteristics. Primarily, you’ll need a fly that is weighted and sinks down to the bottom quick, yet light enough to remain stealthy and not disturb the fish when the fly lands. The sink rate on bead-chain eyes is a bit too slow, large heavy lead eyes make too much noise when they plop down on the water, so a happy medium is an extra-small (3.2mm) lead eye. Additionally you’ll want to keep the hook size small, usually around a size 6 or 4, and opt for a wide gape, chemically-sharpened hook as their donkey mouth full of molars doesn't make setting the hook an easy task. Furthermore, you’ll want to keep your flies streamline, simple, and short. Keeping a short tail on your fly pattern will help you get more hook sets as they will often nibble on a longer tail and never get the hook fully in their mouth. Sheepshead are omnivorous, which means they eat just about anything; but the bulk of their diet appears to be barnacles, small crabs, and shrimp so it’s no surprise that flies resembling these are the best choice. This winter take some time to revisit that favorite Redfish flat and go target the elusive and shifty Sheepshead. You will quickly be addicted to the adrenaline rush that sight fishing to these fish can bestow upon an angler. Use this time of year to explore new grounds, try out different flies, and hone your fish reading skills. With lower water temperatures, crystal clear waters, and the seemingly empty shorelines of late winter, fly fishing for Sheepshead is the perfect answer to fill that off-season gap between the fall and spring.